[140 Pages Report] The Natural Language Processing market size estimated to grow from USD 7.63 Billion in 2016 to USD 16.07 Billion by 2021, at a Compound Annual Growth Rate (CAGR) of 16.1%. The report aims at estimating the market size and future growth potential across different segments, such as technologies, applications, deployment models, services, and regions. The base year considered for the study is 2015 and the market size is projected from 2016 to 2021. The market is an extremely profitable market for NLP software-based solution vendors and service providers. This is because the business organizations working in numerous verticals around the world are progressively adopting NLP solutions for bridging the communication gap between humans and machines. The Natural Language Processing market is expected to grow further in North America and Europe and is growing at a significantly fast pace in Asia-Pacific (APAC), Middle East and Africa (MEA), and Latin America. The ecosystem of the Natural Language Processing market comprises solution vendors such as 3M (U.S.), Apple Incorporation (U.S.), Dolbey Systems (U.S.), Google (U.S.), HPE (U.S.), IBM Incorporation (U.S.), Microsoft Corporation (U.S.), NetBase Solutions (U.S.), SAS Institute Inc. (U.S.), and Verint Systems (U.S.) who offer high-end NLP solutions. 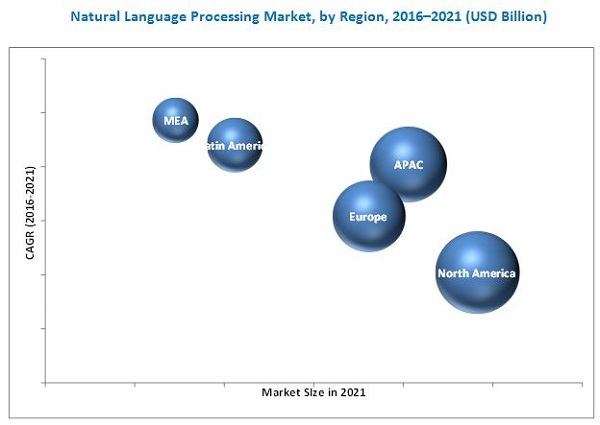 MarketsandMarkets forecasts the Natural Language Processing market size to grow from USD 7.63 Billion in 2016 to USD 16.07 Billion by 2021, at a Compound Annual Growth Rate (CAGR) of 16.1%. Major factors contributing to the growth of the market are increase in smart device usage, demand for enhanced customer experience, and potential growth in machine-to-machine technology. The Natural Language Processing market is segmented by technology, service, deployment model, application, industry vertical, and region. Increasing adoption of machine learning techniques that are used in statistical NLP solutions leading the statistical NLP type segment to witness the highest CAGR. The various technologies are categorized into three major types, namely recognition technologies, operational technologies, and analytics technologies. Among all, the interactive voice response technology is expected to dominate the Natural Language Processing market in market size while optical character recognition and pattern image recognition technologies are expected to grow at the highest rate during the forecast period. Also, speech analytics is gaining impetus and is growing with a high CAGR in the technology segment of the overall market. This is due to the high demand for voice recognition and speech processing systems. The market includes professional services and support and maintenance services. Among them, professional services segment is forecast to grow at the highest CAGR, this is due to the fact that organizations are looking for NLP solutions along with installation, maintenance, and consulting services in the market. Organizations are rapidly deploying NLP solutions either on-premises or on-cloud. The growing demand of extracting and forming structured data sets from clusters of unstructured data online is driving the growth of the on-demand deployment model in the Natural Language Processing market. Its growth is specifically high in enterprises, where low cost solutions are much required. Major applications of NLP are machine translation, information extraction, report generation, and text processing question answering. The machine translation application is estimated to have the highest market size in the forecast period. This is mainly because machine translation is the building block of all other NLP applications and it converts speech or text inputs from one language to another. The healthcare and life sciences vertical holds the largest share of the Natural Language Processing market in 2016. The growth is fueled due to better management of the clinical documentation. The media and entertainment vertical is expected to grow at the highest CAGR during the forecast period due to recent developments, upcoming technologies and ample amount of data or language processing that is increasing day by day in the entertainment sector. North America is expected to have the largest market share and would dominate the market from 2016 to 2021, due to the presence of a large number of vendors. MEA offers potential growth opportunities for the Natural Language Processing market to grow. The key factors driving the growth rate in this market are increasing data generation in business organizations across the globe, growing demand for enhanced customer experience, and increase in the adoption and utility of smart devices. The proliferation of smartphones and social media has introduced a new level of derived languages. This language can either be used in very small sentences or with a few slangs and jargons. NLP techniques are not able to identify this text corpus which is grammatically incorrect. Hence, this kind of gap between the humans and machines can be considered as a challenge in this market. The major vendors in the Natural Language Processing market include 3M, Apple Incorporation, Dolbey Systems, Google, HP, IBM Incorporation, Microsoft Corporation, NetBase Solutions, SAS Institute Inc., Verint Systems, and others. These players adopted various strategies, such as mergers, partnerships, collaborations, and new product launches to cater to the needs of the NLP market.